With last year's launch of macOS Sierra, Apple brought its digital assistant Siri to its laptop and desktop computers, but it looks as though the upcoming iMac Pro is going to go a step further and let you activate the app with a "hey Siri" voice command. In other words you won't have to click to talk to the assistant, you can just start talking. Apparently, the feature is even going to work if your iMac Pro is switched off, thanks to a separate A10 Fusion chip, the same processor that launched inside the iPhone 7. 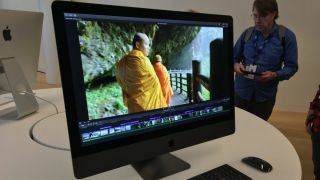 All of this information is courtesy of some code digging by developers Jonathan Levin, Steve Troughton-Smith and Guilherme Rambo, who have been looking at the software destined to appear on the new, high-end Mac desktop. Until we hear from Apple though, none of this is confirmed. Having an A10 Fusion chip running alongside the beefy 8-core Intel Xeon processor would allow the iMac Pro to handle less demanding tasks - like launching Siri, for example - without having to draw too much power. The Touch Bar on Apple's MacBook Pros is powered by a similar secondary processor. The idea is that the mobile chip could be always running, even while the iMac Pro is switched off. It also potentially opens the door for tighter integration between macOS and iOS in terms of communication and security, though it doesn't look like we'll be getting Face ID on the iMac this time around. Everything should be revealed soon enough, with the iMac Pro still on course for a December launch just in time for the holidays. Watch this space for our detailed take on the computing juggernaut, and news of the potential "hey Siri" wake command.